Fast-acting, water-soluble, natural Vitamin E. Elevate W.S.’s unique formula is a highly bioavailable source of natural vitamin E. Developed to increase circulating blood levels quickly, it has become the product of choice for veterinarians managing horses and foals with neurological and muscular disorders, compromised immune response, or low fertility rates. Elevate W.S. is available only through a licensed veterinarian. Contact your vet for an ordering code today. Elevate W.S.’s unique formula is a highly bioavailable source of natural vitamin E. Developed to increase circulating blood levels quickly, it has become the product of choice for veterinarians managing horses and foals with neurological and muscular disorders, compromised immune response, or low fertility rates. Vitamin E is an essential nutrient. A powerful antioxidant, vitamin E supports healthy muscle and nerve cell function, a robust immune response, and maintains reduced levels of oxidative stress. The natural vitamin E in Elevate W.S. has undergone state-of-the-art processing that converts it to a water-soluble molecule, which is absorbed more efficiently. The vitamin E in Elevate W.S. is readily available and effective in crossing the blood-brain barrier, which makes it helpful in the management of neurologically challenged horses. When administered, Elevate W.S will quickly increase circulating blood levels of vitamin E.
Vitamin E is the most powerful antioxidant in the equine diet. But not all forms of the vitamin are created equally. Most supplements contain synthetic vitamin E (dl-alpha-tocopherol acetate), which is not as potent as natural vitamin E (d-alpha-tocopherol acetate). Compared with synthetic vitamin E, the body can more efficiently transport and deliver natural vitamin E to targeted tissues. Current research in several species, including horses, shows that natural vitamin E is two to three times more potent than synthetic. Water-soluble vitamin E can be absorbed efficiently from the gastrointestinal tract. Because of this rapid absorption, vitamin E is readily dispersed into the blood and to outlying tissues. When other forms of vitamin E are fed (oil-based or emulsified forms, e.g. ), the digestive system must break down the vitamin E before it can be used, thus delaying absorption. Assessment of vitamin E status is accomplished by measuring levels in plasma. In a recent study, plasma levels of horses consuming three types of vitamin E were compared: synthetic vitamin E acetate powder, natural vitamin E acetate powder (Elevate® Concentrate)[hyperlink], and natural, water-soluble vitamin E liquid (Elevate® W.S.). Dramatic increases were noted in horses fed natural, water-soluble vitamin E liquid (Elevate W.S.). From baseline values, blood levels rose an astonishing 207% when horses were given 8,000 IU of water-soluble vitamin E liquid (Elevate W.S). 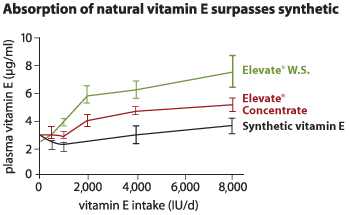 Blood levels of natural vitamin E acetate powder (Elevate Concentrate) also increased, but not as quickly. This study did show that plasma levels fell slightly when horses were fed synthetic vitamin E powder. Oral solution for animal use only. Administer daily at the rate of 0.2-0.6 mL per 100 lb (0.4-1.2 mL per 100 kg) of body weight to deliver 1,000-3,000 IU per day. The feeding level depends on the type of horse, level of activity, and nutritional and management practices that affect vitamin E needs. For best results, Elevate W.S. should be fed soon after removal from bottle. Do not allow Elevate W.S. to sit out of bottle for prolonged periods of time on feed or in an oral syringe. Elevate W.S. should not be mixed into complete feeds or stored for prolonged periods of time. Store Elevate W.S. at room temperature or under refrigeration. Avoid freezing or excessive heat. Reseal lid during storage. (Administer product shortly after removal from bottle.) Shelf life is 24 months from date of manufacture when stored under suitable conditions. Making the Transition from Elevate W.S. to Elevate Concentrate. It may be appropriate for a veterinarian to prescribe long-term vitamin E supplementation to certain patients. While Elevate W.S. can be used over the long term, in some cases it will be advantageous to change the patient over to Elevate Concentrate. When switching from Elevate W.S liquid to Elevate Concentrate, a transition allows the horse to adapt to the different form of vitamin E. Transitioning over a period of 3 to 6 weeks, (depending on level of supplementation) is recommended. Over this time period, slowly decrease the amount of Elevate W.S. and replace it with equal IUs of Elevate Concentrate.